Can It Deliver "The Perfect Cup"? 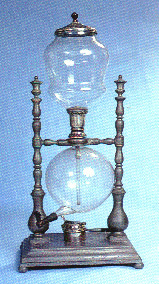 Vacuum pot brewing is arguably the most unusual and fascinating method ever invented for brewing coffee. In addition, it may well produce the best cup of coffee you’ll ever taste. Some folks (including the owner here at Lakota Coffee Company) say that the Vacuum Brewing Method has brought them closer to "The Perfect Cup" than any other brewing method! 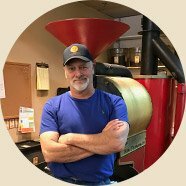 If being fully engaged in a unique method of coffee brewing brings you joy, and if "out of this world" quality "in the cup" doesn't hurt your feelings either, then you may want to pay close attention to the contents of this article. relatively affordable. 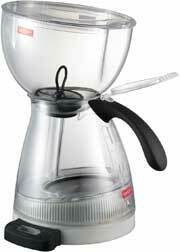 If you would like to purchase it from Bodum, just click on the picture. For an excellent tutorial on how to use it, click on the I Need coffee icon just above! Patent filings indicate that vacuum pots were being used in Germany by the early 1800s. The popularity of vacuum brewing spread throughout Europe very quickly along with plenty of notable improvements in design. Madame Vassieux of Lyons patented a lovely "Glass Balloon" design in France in 1841 consisting of a blown glass double-globe. The lower globe was equipped with a spigot to dispense the coffee. It featured a lovely metal "Crown" on top of the brewer. The elegance, style, and functionality of these blown glass vacuum brewers quickly removed them from the kitchen. They became prestigious center pieces on dining room tables across Europe, providing delicious full bodied coffee as well as wonderful entertainment for guests and family members alike. When heat is applied to the water in the bottom vessel, it expands, creating water vapor. This builds pressure, driving the heated water up a siphon tube, through a filter into the coffee grounds. By the time it reaches the boiling point all but a small amount of water will have been forced to the top bowl. At this point, only vapor is moving up the tube, further heating the brewing coffee while creating a gentle rolling action that thoroughly extracts the coffee while keeping it at a nearly perfect temperature. Once the brewing is finished, the heat source is removed. The bottom globe immediately begins to cool and the gases begin to contract. Lo and behold, the coffee is "vacuumed" back down into the lower chamber before your very eyes! The brewing takes approximately 12 minutes to complete and is a complete kick to witness. O.K. So what's the big deal? Sure it's cool to brew coffee this way but why is Vacuum Pot Brewing any better than other methods? The perfect temperature for brewing coffee is just off boil, or about 205 degrees. 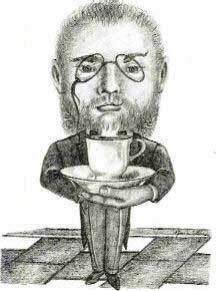 The optimal length of time for coffee to be in contact with hot water is approximately 4 minutes. Gosh, it would be even better if the coffee was gently agitated during the process, oh, and wouldn't it be nice if some benevolent force of nature would "draw" the coffee through a mesh filter that leaves the coffee with a nice clean taste!? All of these factors are nearly perfect with Vacuum Pot Brewing. So you get an amazingly clean, full-bodied cup of Joe and it's great fun too! Have you tried Lakota's Fresh Roasted Coffee yet? You know, you can use any coffee you like with your new Vacuum Pot Brewing System. But my thought is "Why not choose a World Class Coffee to go along with it?" If a "World Class" coffee experience, or maybe even "The Perfect Cup" is your goal, then be sure to read our ironclad guarantee at the bottom of this page. The owner here at Lakota Coffee Company had one of his most memorable experiences with "quality in the cup" from using Bodum's Santos electric vacuum coffee maker. He told me that it was the closest he's ever been to the perfect cup! The most famous coffee roasters agree that even the highest quality of coffee beans and the most sophisticated roast will not make a good cup of coffee without the right brewing system. In order to create the perfect brewing system, we put more than four decades of Bodum coffee experience and the famous Bodum design into producing the electric Bodum Santos Vacuum Pot Brewing System! From the power base you can serve 6-12 cups of freshly brewed coffee that is as strong and delicious, as if it came from a Bodum French Press. 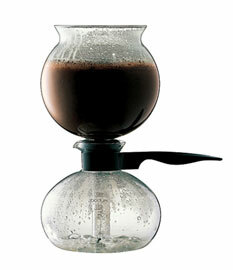 A taste made possible with a high tech heating system developed especially for the Bodum Santos. There are no paper filters to make the coffee dull! Just a small easily cleaned micron nylon filter for smooth, clean coffee. This is an entirely closed brewing process where no aroma escapes and where the relation between temperature and time has come into its own state of perfection. In Closing: Check Out The Lakota Guarantee! You will be absolutely amazed by the aroma, flavor, and body of your fresh roasted coffee purchase. You also get our no strings attached, no questions asked guarantee that it will be the very best or at least among the very best coffees that you have ever experienced or you get every penny back including shipping! You don't risk a dime and don't even bother returning the coffee! Consider it our gift for giving us a try. No, it's just that we know what we have. Lakota Coffee Company’s Fresh Roasted coffee selections are in keeping with all of the exacting standards discussed within this website and we would love to share our experience of "Coffee Nirvana" with you! With that in mind, we are willing to take all the risk and in turn, you get a selection of coffee that is second to none and a legitimate shot at "The Perfect Cup!" Just click here on Lakota Home to place your order!